McLaren Automotive recently revealed the Speedtail, its first GT offering and announced that all 106 of its limited run units had already been sold out. The company is not wasting any time in getting the Speedtail ready before deliveries begin in 2020. So comes the test prototype of the McLaren, named Albert. The name harkens back to the original test mule of the iconic McLaren F1 from the early 1990s. The common name for the test mules may stem from the fact that the Speedtail as the F1 has a unique seating configuration with the driver sitting in the centre of three seats. The prototype is officially named MVY02. MV is the initial for all McLaren projects, while Y signifies the central Y point of the XYZ axis in computer-aided design. This seems to be a nod to the Speedtail's central driving position. And the 02 suggests this is the second prototype of the GT car. 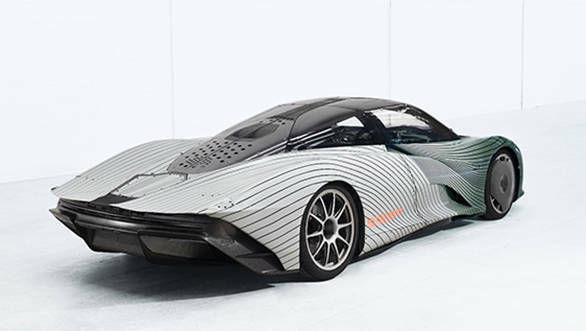 Under the 720S face grafted onto the camouflaged Speedtail body of Albert, is a 1,050PS petrol-electric hybrid powertrain. It is likely that the petrol part of this powertrain is a variation of the 4.0-litre twin-turbo V8 found in other McLaren offerings. The testing of the prototype will happen at the hands of IndyCar racer Kenny Brack. Brack is also famous for having driven the McLaren P1 LM around the Nurburgring in 06min 43s. His skills could come in handy in the Speedtail, which has a claimed top speed of 403kmph.